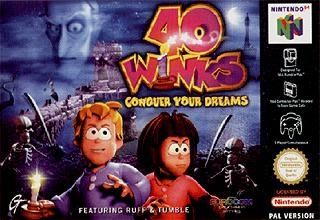 40 Winks is a 3D action-platform game in which you play as Ruff or Tumble, two children who must battle ghosts, goblins and other monsters in their dream-world. They must try to capture 40 winks scattered around the world in order to stop an evil old man named Nitekap. Nitekap wants to turn the winks into hood-winks, the things responsible for nightmares. You also have to find the 12 dream keys to unlock the boss level. A unique aspect of the game allows the players to temporarily morph into different costumes with special abilities. The costumes include a Prehistoric Man, Jester, Super Hero, and Ninja. The battle for the world's dreams has begun Ruff and his twin, Tumble, are on a mission to save our dreams from evil monsters by collecting and saving the 40 WINKS. Developed by European super-developer Eurocom, 40 WINKS follows the adventures of the siblings, who are battling baddies in order to save the world's dreamers from having permanent nightmares. Levels include a Medieval Castle, a Space Adventure, a Pirate Harbor, an Atlantis-esque Undersea Quest, an over-sized Toy Box, a Haunted House, and last but not least, a Prehistoric Adventure. Players can also assume different power-ups and attributes by changing costumes, ranging from a Ninja outfit that grants Ruff or Tumble mind-control and sword attacks, to a robot costume that allows your character to fly and fire missiles. Fun and addictive mini-games are also littered throughout that range from Dragon Racing against the bad guys to Biscuit Spitting an Ancient pirate tradition that plays out like a decathlon event. Save the world and its dreams with 40 WINKS for the N64.